Saturday, November 24 2018, the Audubon Park Garden District celebrates Small Business Saturday, a national day to promote shopping at small businesses. Over 97% of the APGD businesses are independent and locally owned, each with its own unique story, products and hardworking owners who contribute so much to our community. Their passion and commitment to the neighborhood and to their customers are what make this area so special, so we hope you'll support them on this Saturday and throughout the rest of the year. On Shop Small Saturday receive a Shop Small canvas bag with purchase at any participating APGD member businesses, while supplies last. Five of the bags given away on Shop Small Saturday will include a Golden Ticket, each one redeemable for a pair of passes to our Retro Modern Home Tour and After Party, which returns April 6, 2019. All of the canvas bags will also contain a super cute luggage tag from R. Nichols, along with a 20% off coupon. Save at Fusion Hair Design on Shop Small Saturday - they're offering 25% off all retail, minus holiday gift sets. Huge specials at Sprinkles Jewelry and Gifts for Black Friday, Small Business Saturday, Super Sunday and Cyber Monday 11 am-5 pm! Everything on sale storewide! Complimentary snacks and beverages! Free gift with purchase! Also includes - Famous bed sheet sets $20, pop up laser greeting cards $5, knuckle rings $3, tin signs $5, Himalayan salt lamps $9, wood watches $20. Plus everything $2 gift tables, everything $4 gift tables, free gift wrap/enclosure card packages with purchases and full price items take 20% off! The first 100 customers who make a purchase on Saturday, November 24, at Park Ave CDs will receive a free CD grab bag ($5 value)! Everyone who buys a ticket to the Shop Small Sip and Stroll is entitled to 20% their purchases at Freehand Goods, inside East End Market. Photo by Steven Miller Photography. Live Music Stroll 2 to 5 p.m. Enjoy live music al fresco throughout the district, including Theo Moon in front of The Lovely Boutique Market, Brian Mays inside Stardust, Jessica Delacruz in front of The Owl's Attic and Jestelle in East End Market's courtyard. Tinsel and Tidings Window Walk and Contest. This holiday season, our businesses will decorate their windows and shops with creative holiday displays for all to enjoy. The fun and festive creations will delight residents and visitors who can vote for their favorite November 24 through December 24. Just snap photos of your favorite decorated windows and/or interiors, post to Instagram or Facebook, use the hashtag #apgdholiday and either tag the business or use a hashtag to ID them and you're automatically entered to win an APGD gift basket. * Shops participating in the Holiday Window Walk include Palmer's Garden and Goods, Warrior ONE Yoga (west plaza), The Lovely Boutique Market, Park Ave CDs, Stardust, Flower No 5, Warrior ONE Yoga, Row and Spin (east plaza), Bikes Beans and Bordeaux Cafe, The Owl's Attic, Sprinkles Jewelry and Gifts, Kelly's Homemade Ice Cream and Blue Bird Bake Shop. 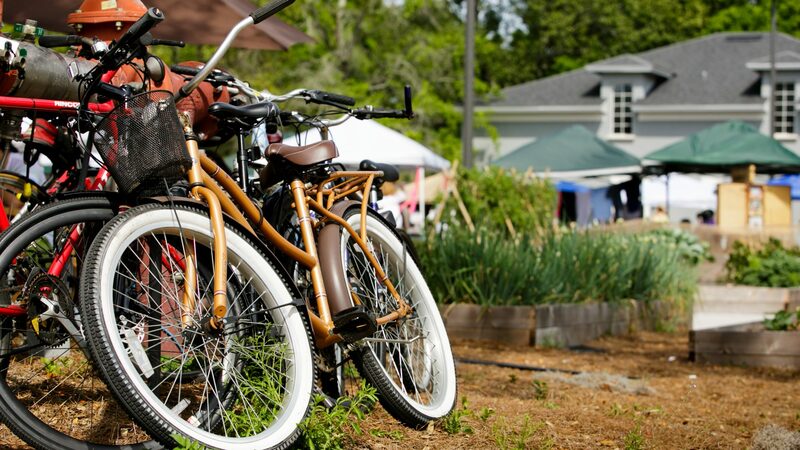 From award-winning vintage shops and fabulous restaurants to boutiques, salons and dessert places, help make Small Business Saturday the biggest day of year in the Audubon Park Garden District, Orlando's Great American Main Street! The Audubon Park Garden District is conveniently located between Winter Park, Leu Gardens and Baldwin Park, minutes from downtown Orlando. Check out how to get here and where to park here. *The business with the most photos by midnight December 25 will win the People's Choice award. Drawing for the gift basket will be held December 26, 2018, with the winner of the drawing notified via social media. Randomly selected winner will have seven days to respond and make arrangements to take delivery of the gift basket.